I can’t believe I still have posts about Sawyer’s birthday not published right now. Things have been crazy and I keep meaning to make them a priority but I promise they will all get shared! I only have one or two left. 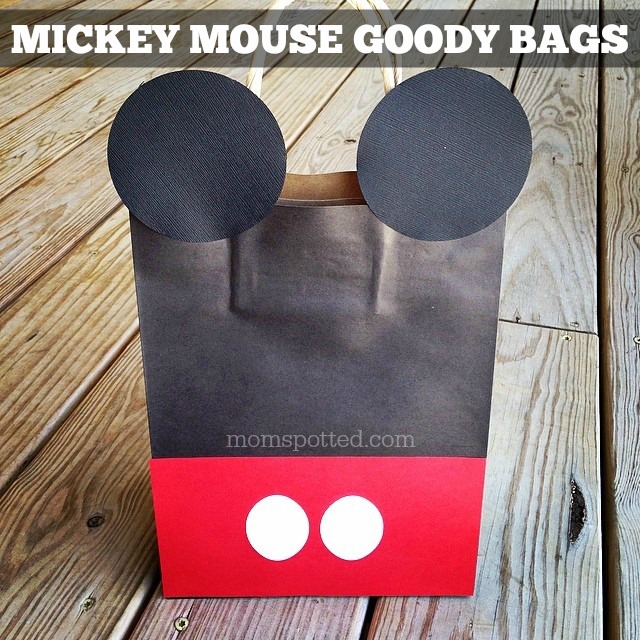 Today I want to show you the Mickey Mouse DIY Birthday Goody Party Bags I made. They came out so cute! 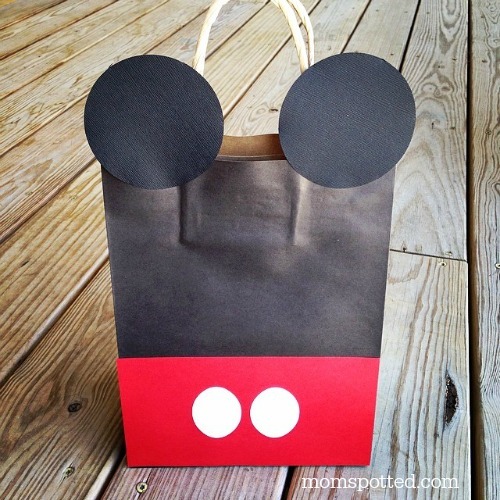 The Mickey Mouse goody bags were super simple to make. I looked around at a few places for black bags but I really liked the ones I found at AC Moore. Most craft stores sell solid color bags with and without handles. The preference is up to you. I chose handles so they were easy to carry. I liked the natural ones because they faded into the background more than the white ones I saw in other stores. 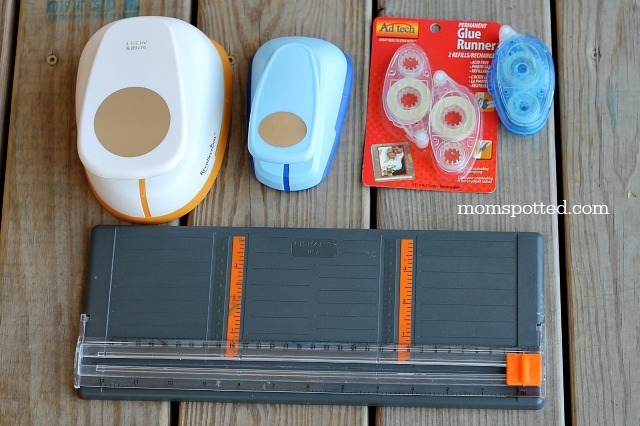 Before you grab your glue prep all your paper. Having three kids running around the house I always like to prepare so that if I stop I can pick up easily. 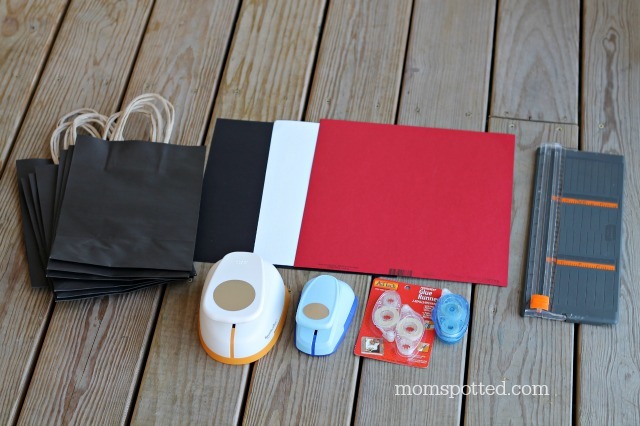 One 3-4 inch red card stock strip the same width as the bag you chose. Now that you have all your pieces they rest is a breeze. Grab your glue of preference and then adhere the red strips at the base of the bag. 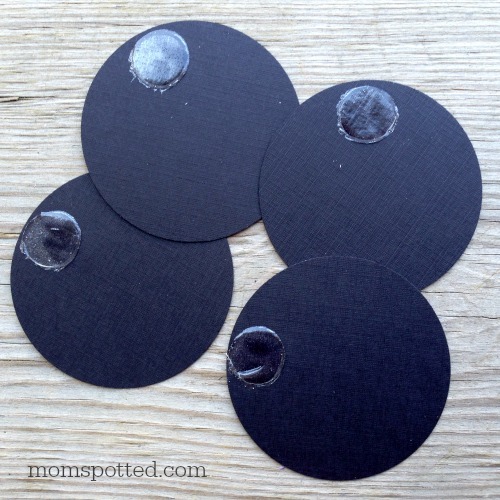 Then take your white oval and stick them on vertically centered. I found standing and having one in each hand helped visually place them faster. Then attach ears. I just added a little glue to the base and then attached them. It’s okay if they partially cover the handle. You’ll still be able to carry it okay. 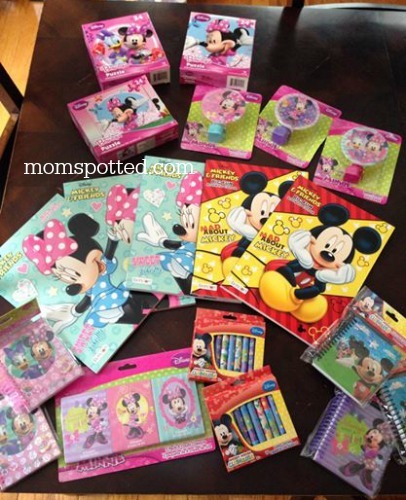 I found a bunch of great Minnie & Mickey products at my local dollar store and made them all identical. If you notice I actually only have stuff for 5 kids but I knew I wanted them on the table and made a 6th and left it empty. I used red tissue paper to top them off. They were a HUGE hit! 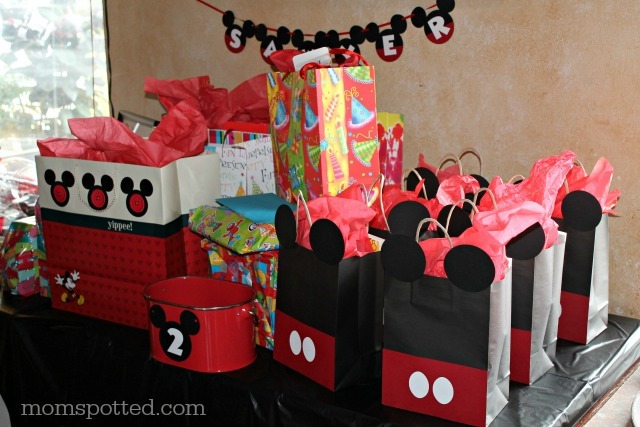 Didn’t our Mickey Mouse DIY Birthday Goody Party Bags come out great? 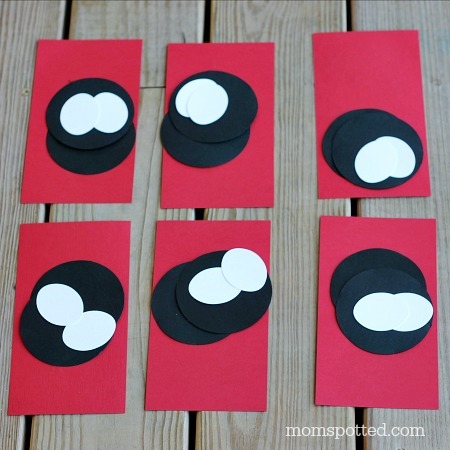 Stay tuned for other posts about Sawyer’s DIY Black, White & Red Mickey Mouse Birthday Party. Click the link to see the posts we’ve already shared to far! That is so darn cute. 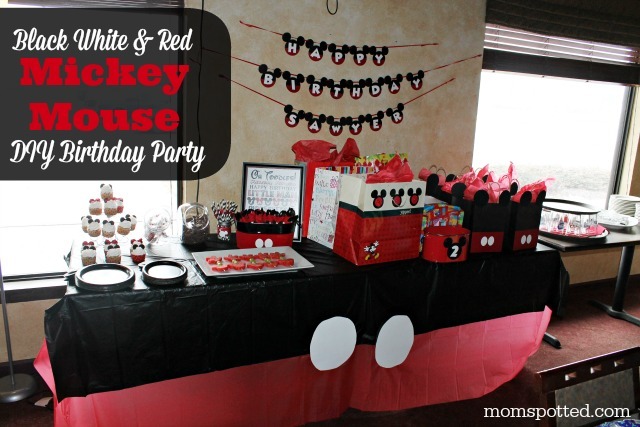 I am in the middle of planning my boys Pokemon birthday party and now I totally want to make it a Mickey party. I love them, they look so classic! Easy to make too, thanks for the idea! these look amazing and seem like they were pretty easy and quick to make. i would love to do this for one of the birthday parties coming up. thanks. That would be a cute idea for any sort of Disney themed party. THose bags are too cute! Oh those are so cute! This could be a very fun craft for a birthday party!! Jennifer, those are SO cute, they turned out so nice! They looks relatively easy to make too! I think this is so cute. We were just making Mickey today out of Play doh. I’ve got to try this with my kids. What a great idea! Your photos and instructions are excellent. Thank you so much for sharing. I love that these Mickey crafts are easy to make and perfect for my little boy! I love how easy these are to make! They look like bags you could buy in a store! Those are so adorable! What a fun idea! These look so cute and they were pretty easy to make which I love! Thank you. Pinning this to my Disney board for sure! That’s adorable! What a clever idea. The whole party looks awesome! I love this idea. What a perfect bag. I would save this after the kids pull put their treats. These party bags are really creative and fun. Any child will enjoy getting these bags after a fun party. How adorable! I love any and all things Disney, and when they’re easy crafts like this, I love them even more! They turned out so nicely, I definitely am pinning to use as treat bags for my daughter this summer. Such cute party bags, what an adorable theme, you did a great job, and if you were doing a party for a girl, I bet you could do similiar bags just add a pink and white polkda ribbon. WOW your party theme came out fantastic! Love it all! And those bag are super cute, and easy to make. The cupcakes are my favorite. Wow, those instructions are so explicit, even I can do it (I think). The party decor looks very pulled together. Thanks for sharing! So cute!! The bags look easy enough that I could actually maybe do them myself, but yet they are so cute! This is adorable. Thank you for sharing with us. This is cute! A great way to personalize the occasion even more.